Dyslexia remains. Despite having 6+ years of doing NOTHING BUT MATHEMATICS, I am still dyslexic. About a week ago I had surgery and was taking Vicodin. For the most part I was coherent. But my dyslexic was rampant! I couldn’t tell you (correctly) if the item in question was on the right or left side of the closet. I would picture it in my mind and know exactly where it was and then I would say the opposite. Over and over and over. left, right, left. It got to be so common that my parents stopped even asking me for a correction. left. They would just throw out that piece of information as worthless. 1) I’ve been using Matlab actively for the last 6 years or so and in the whole of 6 years working with matrices I have never *ever* bothered to really learn if [1,2,3; 3,4,5] produces a 2×3 or a 3×2 matrix. Like, if a matrix A has size 3 x 8 and I want the first column vector, does that mean I should use A(:,1) or A(1,:)? Turns out the former is the correct notation. But who cares?! I just guess and check every time. This is literally what I just did to write this paragraph. 3) Then there was the time when I was standing in front of my colleague/mentor and confidently wrote an epsilon (ε) instead of 3. And, upon further consideration, I didn’t notice my mistake. If you like this post please click on the subscribe button on the left–right-left? , oh screw it. Readers, there’s a button SOMEWHERE on this page to do so. It’s a fun game: go find it. Aside | This entry was posted in Communicating Math, Learning and Teaching Math. Bookmark the permalink. I can’t keep sine and cosine straight. Their trig identity stuff I could sort of handle, because I concentrated on memorizing only the ones I absolutely needed, and then I just derive the rest of them during the test. And then I got to calculus. And I would regularly mix up which was supposed to be positive and negative. It was the very last thing I looked at for every single calculus exam/quiz, and I wrote it down at the top of every exam or quiz first thing. It was the first thing to go on any allowed math cheat sheet. I was known to include that on cheat sheets for non-analysis classes just in case it was assumed knowledge for some reason. My Calc 4 midterm at Smith was unusually in class, and we were allowed a page of notes we didn’t have to turn in. 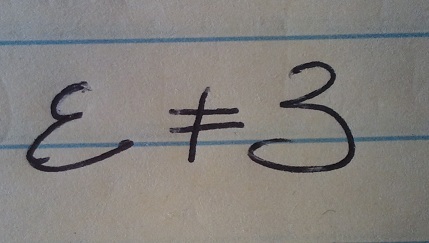 On my notes, I wrote them backwards. So I got roughly 50% of the answers wrong. But it was the second class I’d had with Cat, and she knew me, and even without having my notes sheet, she knew immediately exactly what I did, so she just graded all the sin/cos questions backwards, I did everything else right, so she just took two points off for my “one” mistake. Yes! Beautiful example. I think it’s rare to find an educational space which allows for mathematical quirks without overly punishing “simple” mistakes! It’s amazing what seems trivial and what seems important to each person. Apparently, my colleagues have stopped listening to what I say when I’m writing on the board because they often don’t match. My friends have learned that what I write is usually correct and what I say is worthless. Actions speak louder than words! Thanks for sharing your story!